Today, we have Sanjeeta mam with us in 'Road Not Taken'. Thanks for your time mam. Sweet of you to answer all the questions in detail. -‘Food Stylist’ was added to my dictionary only after I got to know you. 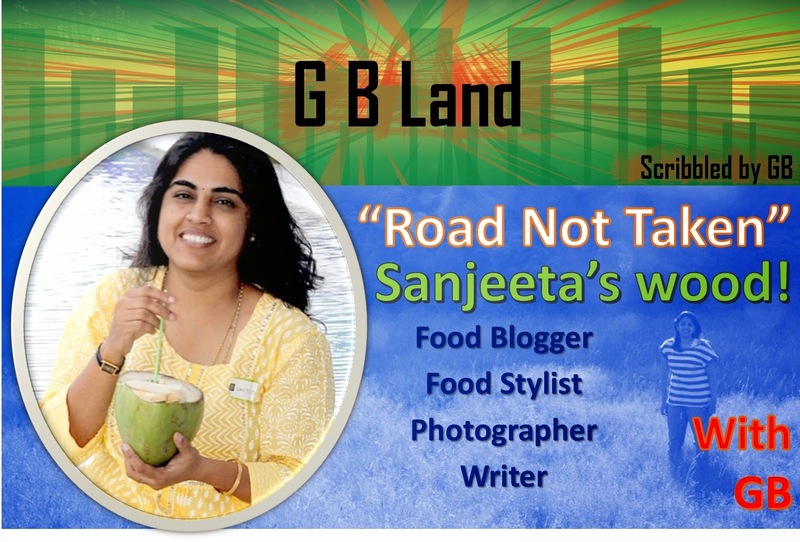 Please let my readers also know the food stylist Sanjeetha. Please introduce yourself for the readers, who don’t recognize you. 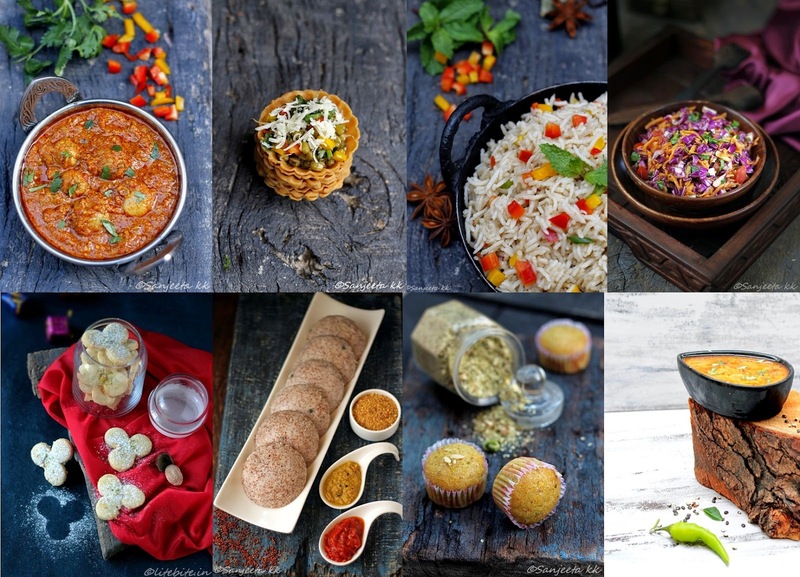 I am Sanjeeta kk, a forty something mom, cook, stylist, photographer and writer at Lite Bite. -Tell us about your educational background. I have done masters in Economics and business management and have worked in corporate world before settling to marital bliss in 1996. I like to keep challenging myself, be it learning new style of painting or creating a new dish for my family. After almost ten years of stagnation in life after my marriage I wanted to seek out new endeavours where I can work at the comfort of my home. And that is when in 2009, Lite Bite happened. Food blogging started as a platform to document my recipes, share my food stories and to connect with like-minded people who share the same interest across the world. -Are you a foodie? What kind of an eater are you? Do you eat for living or live for eating. If you go by the definition of wiki "A foodie seeks new food experiences as a hobby rather than simply eating out of convenience or hunger." Yes, I am a foodie and I eat for living. But I don't eat very much, I love to feed, style and click the food I cook. -Tell us about your childhood days in the kitchen. My obsession with food began at an early age when I started to help my working mother in her kitchen. Though it was restricted to just rolling chapattis and making salads. Looking at the colourful 'Dabba' of spices and to watch the rotis puff up magically always made me happy. - What does the popular food blogger Sanjeeta do as a routine? Day to day activities. 5:30 am; wake up and have my morning milk..err..yes, I am not a morning coffee person. A small walk..well, most of the days. Cook and pack lunchbox for my husband who leaves home by 7am. 7-9am; run behind my children, make breakfast and get them ready for school. 9am; home alone...eat my breakfast, sip my first cup of tea and plan for the day ahead. 10 am-1pm; some mundane household works, grocery shopping and start lunch prep for children. 2 pm - 3.30pm; My favorite time of the day when I get to log into my lapie and do what I like the most...food blogging! Bring back the children from school and after which it's again taking care of family, house, children, cook and repeat. 11pm; And if I am not tired, I do work late night on my blog and do some online reading after making sure that my children are asleep and my responsibility as a mom is done for the day. -What was your first cooking experience? Do you have a photograph of that? I fell in love with food and cooking as early as 1970's when I used to visit my grandmother's home during my summer vacations. My granny would get up in the wee hours of morning to milk the cows and use the milk to set a creamy yogurt for next day. She would then use the same yogurt/curd to make 'Kadhi' or Mor Kulumbu, which was slow cooked for hours on a wooden hearth. I love the unusual kitchen tools that she used. The stone 'Ghatti' which was used to grind grains, indigenous earten stove, a long iron funnel to keep the fire-wood burning, large mud pots to cook curries made me fell in love with kitchen and Indian cooking. It brings a big smile to my face whenever I visualize that dark yet warm kitchen with smoky smell emanating from the fire-wood from the kitchen of my granny. Oh...how much I loved to watch her cook. The sound of that bubbling cauldron of 'Kadhi' in her kitchen was like music to my ears. -Has any of your dish become miserable to eat? Can you share some funny moments from your kitchen? Hmm...well, as I started to cook at a very early age, fortunately I had very few mishaps in kitchen as far as Indian cooking is concerned. But yes, my early days of baking and trying out some international cuisine did see many dishes which looked and tasted too weired. Chewy cup cakes, Naan and Pizza bases which could give complex to a Frisbee....but then, that's a part of learning and growing I suppose. -When did you start taking up styling as a serious profession? 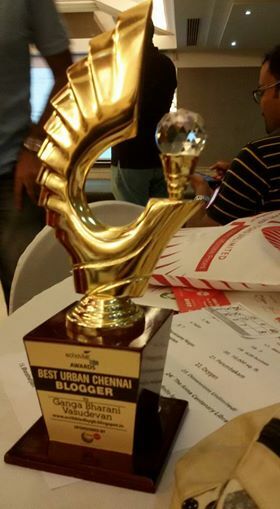 It started late in 2011 when I got my first call to do a photo-shoot for Brown Tree in Chennai. I have completed many national and inter-national food styling projects in television, advretising and packaging industries. Was recently been involved in a 'product ideation' team for Asia pacific group of Kellogg. Have been sharing food articles for some online magazines other medias. -What were the challenges and difficulty that moulded you into who you are today? Sometimes I feel that pursuing one’s passion is a luxury you cannot afford to indulge in everyday. Hectic lifestyle, family commitments and responsibility towards bringing up my children keep my passion at bay, at times. And struggle I do every day to fit my passion into my life, but that does not deter me from pursuing my dreams any less. -Were you discouraged? Can you share some of those which became a real motivator for you? Have you challenged anyone? Technology, gadgets and content writing were my three most dreaded hurdles when I started blogging. And they still remain so. HTML, codes and plugins give me nightmares and I try to keep them at bay by not meddling with the blog codes or worry too much about seo's and the like. I did not unpack my dslr camera from its box for almost three months after my hubby bought it for me in 2011. He used to make fun saying that 'it' won't bite you, just take it out and start clicking. It took me many days to get comfortable with the digital camera and start clicking food pictures. Coming from a small town, I never had much exposure of reading good books let alone writing something in English. I have slowly started to overcome some of these fears of mine through food blogging and write a few lines to make a readable blogpost. -I am jealous of your husband and kids. They get to eat five star cooking every day. Tell us how they enjoy eating. Some interesting incident from inside your house. On the contrary, weekdays at home are quite hectic and I hardly get any time to cook something special. But yes, weekends are reserved for good food. -‘My grandma is the best cook’ most people say. Did your grandma inspire you? Already mentioned in above comments. -If you are offered a chef job in a star hotel will you take it up? No. With due respect to the noble profession. Cooking makes just a small component of my food blogging endeavour. The other most important factors being, sharing my food stories, making friends, food photography, food writing and styling. -How much do you earn? I am not asking this to send a report to income tax ;) People should know that making a living with something we are passionate about is not difficult. Parents thing only engineering, medicine or being a CA pays well. I earn fairly good amount to run my blog and to hunt for props. -What’s your plan for the future? To start a restaurant yourself? No. As of now I wish to focus more on improving my skills in photography, content writing and to become a better blogger and take my blog to the next level. -Can you tell us about your journey from trial to the magazine interviews? I feel the above answers fairly explains my journey. -What do you want to tell budding food bloggers and home makers? Find your niche, say something about the recipe, cook and click your own pictures, connect with readers on social media and highlight your personality to differentiate yourself from others. -A Link to you blog/your facebook page. -“Road not taken” has a segment called ‘Confessions’. We would like to listen a confession from the cake queen. Could be silly/ serious. Kaju Katlis and kulfi make me go weak in the knees. Love shooting food pictures but dislike cleaning up the after-mess. Don't pay heed to my hubby's constant reminders to do yoga and to continue my morning walks. Not stressed about grooming or fashion anymore.